Your search will be carried out on the Companies and Markets search platform operated by Implisense. 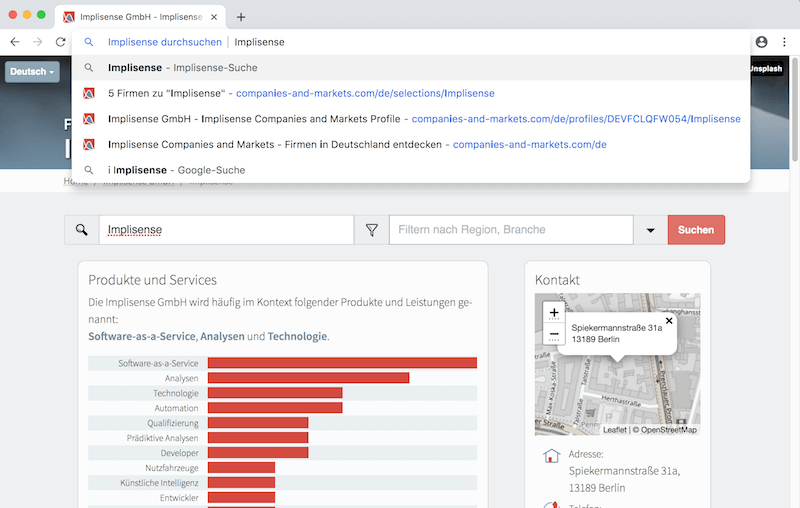 Here you will find important company information of German companies such as company address, check for economic activity / insolvency as well as their products and services and technologies. This information is intended to help you process enquiries and research tasks. Enter the address bar and type in your query by entering the previously defined search abbreviation (e.g. i) and the search term (company name or e-mail address), e.g. i Implisense Press ” Return ” to start the search and display the desired company profile on the Companies and Markets platform. In Firefox you can also set the search. The instructions for integrating the lookup into Firefox can be found here. We offer this service (formerly Implisense E-Mail-Qualifier) permanently free of charge and without registration or obligations. We are looking forward to your recommendations and of course to to your feedback.